As a school librarian, I have certain shticks that I utilize as the occasions arise. Today as a group of fourth graders burst, vaulted, ran, stormed and catapulted into the library where I was subbing, I deployed my standard entreaty to "amble, saunter, meander, mosey, roam, walk, dally, wander, perambulate, drift, or stroll but PLEASE do NOT run!" If I am lucky, about half of the kids stop in their tracks just to stare at me ("This sub is so weird!") and that leaves a managable number to corral and refocus. 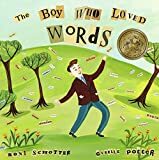 Roni Schotter echoes my own affection for lovely words in The Boy Who Loved Words. Giselle Potter's illustrations have an whimsical Chagall-like quality as the boy decorates a tree with his favorite words. The book includes an abundance, a profusion, a plethora, and a heap of language that will expand, enlarge, embellish and enrich the word choices of all readers.